It's been a tough season for Youngest Son's travel team, the Raptors (as I call them here); this past Wednesday night they played a doubleheader against two different teams -- and lost both by "slaughter." Slaughter rules, or mercy rules, differ from league to league. In the Raptors' league, the game is called after five innings (instead of the seven the boys would otherwise play) if one team is ahead by 10 runs or more. And they lost by slaughter Monday night, too. 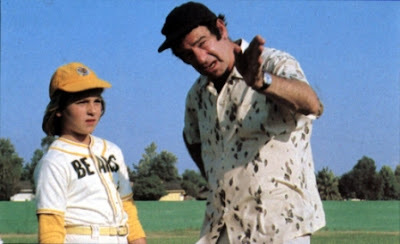 In fact, after Monday's debacle, the coach took the team out into the outfield to run -- a punishment -- and he yelled at them so loudly that the parents, hovering nervously at the foul line, could hear. Long Suffering Spouse and I could hear him, too, and we'd walked halfway back to the car. The parents were upset. Now, this is not a rant against the team parents. I suppose I was pretty harsh on them in my recent essay on their treatment of the Amish Umpire, but these are not bad parents. It's just... well, they're not sports parents. They're not used to coaches yelling at their kids. But that's what coaches do. If they didn't yell, the kids would think they didn't care. Even I yelled from time to time (OK, I howled in incoherent anguish) -- and I was a terrible coach. I don't think the Raptors' parents are dumb; they'll eventually figure out that you have to yell at kids, especially at young teenage boys, if you have any hopes of commanding their attention. But they were offended Monday night. And, by Wednesday, they were fatalistic. One parent said we should change our name to the Livestock because we know so well what it means to get slaughtered. It's an ugly, ugly mood on the club right now. I wrote last summer about Coach Earring and the game we won by forfeit and the mood wasn't as gloomy among those Bluejay Park Reds as it is on the Raptors now. This is supposed to be travel baseball. It's supposed to be a big step up from a recreational league like we had at Bluejay Park. At Bluejay Park, we took everybody who wanted to play, regardless of talent. Or attitude. And everybody was supposed to play three innings no matter what (and on my teams they actually did). You have to try out for a travel team. You have to be picked. Even so, right now I think my Bluejay Park Reds could whomp the Raptors... no matter which team Youngest Son played for. And the Raptors just go through the motions. They botch routine plays. They don't run hard on ground balls. They don't ever take the extra base. A lot of them just shuffle and galumph to their positions on the field -- the kids on other teams run... or at least jog. For the most part, the Raptors look lackadaisical, even disinterested. And no one gets benched. This is quite different from our experience when Middle Son played travel ball, five or six years ago. So we'd driven a long way to see Middle Son's game. And we got there with the game already in progress. Middle Son was standing on second base with two outs... and he didn't move on contact. I don't remember the exact situation; I think the batter got a hit and Middle Son failed to score. The coach called time and asked Middle Son if he knew how many outs there were. Clearly, he did not know... and he was obliged to admit it. The coach pulled him out of the game and he sat the rest of the night. That may seem harsh -- and we weren't thrilled, obviously -- but it was the right thing to do. Middle Son learned a lesson about keeping his head in the game. The Raptors coach hasn't been able to sit anyone the last couple of weeks, even if he wanted to, because he's only had nine kids for most games. But I don't think he wants to -- because he doesn't want to take flak from the other parents. In fact, as I've written before, I think he took a smaller roster into the season just so no one (meaning no parent) could complain about playing time. I feel terrible for our coach at this point. He's clearly exasperated: Monday, even as he was yelling at the kids, he was pacing further and further away from them. He was setting out the distance they'd have to run, yes, but his whole demeanor suggested that he was too angry and frustrated to stand anywhere near them. This coach -- and his assistants -- have sacrificed an incredible amount of time for games and practices... and their efforts are not bearing fruit. I want to offer words of comfort or support -- but the coach doesn't know me. Not like he knows the other parents... his social friends... who are still mad at him for yelling at their precious babies. I think he's a little skittish about parents generally right now: At a recent game, after retrieving up a long foul ball, I walked it back to the bench so the coaches could give it back to the umpire -- and I swear the poor man cringed, until I made clear the innocuous purpose of my very brief visit. I never had trouble with parents when I was coaching, but I know something about losing. Actually, I know a whole lot about losing. So -- and here's the Dr. Phil-type question, if you're still with me -- what, if anything, should I say to show support for the poor guy? I've noticed that 400 posts is a milestone that many bloggers pause to note. I've spilled out quite a few words since December 2005 -- and the only thing that keeps me from writing more is that this doesn't pay me anything... and I need to do stuff that does pay. When I started this exercise I had delusions of grandeur: Some Internet talent scout for a major publishing house would be charmed by my homey and homely homilies and tender a fat book contract. I saw this question yesterday at Miss Snark's website: "Do literary agents ever prowl around blogs searching for gifted writers?" Miss Snark's answer was "no." In the comments, author P.N. Elrod chimed in with this quote from Rachel Caine: "Posting your novel (or blog) on the 'Net in the hopes that a big-time editor (or agent) will see it is like writing the perfect résumé and then tacking it to the front door of your house, hoping your future boss will walk by." 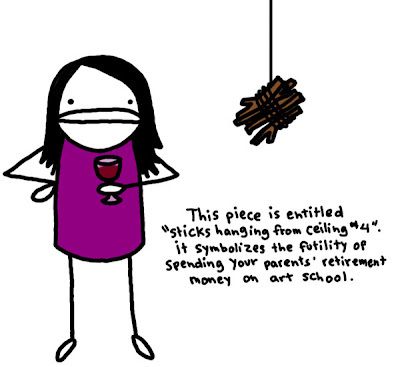 Which was a buzzkill on a couple of levels: It may also explain why I can't get a real job. I was so depressed, I almost didn't put out fresh résumés out on the front door, even though it rained here yesterday. That may be the funniest joke I've written in 19 months of blogging. No wonder I haven't been discovered! It's funny how traffic has built on this blog. This blog has been 'visited' over 14,000 times now... but so much of that traffic has been driven here by searches for topics in the news: Lately, it's Judge Pearson's pants. Before that, it was my link to a Harry Potter video spoof -- the Potter Puppet Pals -- that brought in a lot of visits. Before that, it was Chrissy Popadics, Thiago Olson, and home fusion. I don't do news topics to generate Sitemeter surges (well, OK, Bee, I don't do it anymore), I just write about topics that I find interesting. And I don't think too many return visitors have come in through those posts. In fact, I'm not entirely sure what brought you in and brings you back, but I'm truly grateful that so many of you are regulars. I am particularly grateful for your kind attention earlier this year, when I had my health issues: Blogging was about as much as I could do on any given day -- and having actual readers helped motivate me to do that as well as I could and, I'm sure, helped hasten my recuperation. But, now, to the future: When I started this Second Effort, one of the "hot" blogs was One Red Paperclip -- the true story of Kyle MacDonald who... eventually... traded one red paperclip for a house. (He got a book deal....) I see now that this is probably the model to adopt. Not that I'm going to start trading paperclips for anything.... No, I'm going to keep doing what I'm doing... but I'm not going to worry about the book contract any more. Not directly, anyway: The book contract is now the house at the end of 14 trades (continuing the MacDonald/One Red Paperclip analogy). We'll start with something smaller first... and build. Anybody know a small town newspaper editor who's looking for a curmudgeonly column on parenting... or the law... or almost anything? All I ask are (a) a byline and (b) syndication rights. For the first paper to sign me, no charge for the column for as long as the editor can stand it wants it. That might mean using my actual name... maybe. But I'm willing to negotiate. Captain Picard's Journal -- the first blog to exchange links with me. Blog, blah, blah -- Heather, whose template has changed more often than just about anyone's, I think. Doctor Anonymous -- Doc will get a book deal one of these days. Muffin 53 -- Her Red-Hatted Majesty, the Empress Bee. Musings of a Phenomenal Webmistress -- Shel, my first Illinois link. A Place I call Home -- Mary Anne, of Vancouver Island. Not the first Canadian to link here; that would be Edie, a writing instructor, who, sadly, took her blog offline some time back. Nurse Ratched's Place -- Mother Jones, the third nurse to link here and the proud owner of an enormous paperback library. Crouching Mommy, Hidden Laundry -- CMHL, the first lawyer to link here. But she doesn't write about that sort of thing. The Geek Inside -- Sari in Arizona who doesn't mind my baseball stuff. Too much. Sarge Charlie -- Bee's life and travel and blogging companion. The Bestest Blog of All-Time -- Bobby Griffin, blogging entrepreneur. Skittles' Place -- Barb, blogging phenomenon! Tuskismom Speaks -- Cynthia Bostwick (also from Michigan, Barb) -- second lawyer link... and first poet. Fantasy & Sci-Fi Lovin' Blog -- SQT et al. If you like that sort of thing. Which I do. A Work of Art: Raising Our Exceptional Son -- Bennie, the artist (and frustrated musician), from South Carolina and his son, Ben. Time with Shelby -- Shelby started reading me during law school -- and doesn't blame me at all, which is very generous. Home Fires... by Lois Lane -- My second Illinois link. Lois is not only writing, she's actually sold some of hers. about a nurse -- May, in California. Interesting hospital stories. Ellee Seymour -- English politics. And she lets me comment anyway. Soapbox Jury -- Gave me a nice review when it was starting out. Thermal -- Chris in Scotland. Unlike Sari in Arizona, he does mind my baseball stories. An entrepreneur, yes, but he seems to enjoy the conversation just as much. stuff and nonsense -- Susan, from Philadelphia. Now with Pac-Man and Tetris on her front page. Toadally Talking -- Lawfrog, a lawyer from Houston. idiotfreeamerica.net -- This is Chris, Shel's husband, as opposed to Chris from Scotland. "Life's A Dance You Learn As You Go..." -- Star8278, also in Pennsylvania. A little piece of me -- Claire. Currently having all sorts of problems with the Internet. The Beach Bum Report -- Now in Florida, but originally from Chicago. Are We There Yet?? -- Linda, in Connecticut, dispatching ambulances. And sometimes going to concerts. La La Land -- La La Land has moved: Was in Washington, now in Colorado. Where fiber meets mud -- Fran, the gardener in Ohio. The Mind Wobbles -- Hilda, in Miami, Florida. Letting each other go -- Leo G. About Bup mostly. Not light and frothy. Peppermint Energy -- IML in Singapore. Home in the Highlands -- Landgirl (Sharon) in the Highlands of Scotland. But formerly of Indianapolis. Momma's World -- It's Momma's Word... and Snow White's, too. Frannycakes -- Fran in Maine. Untwisted Vortex - Living in a Different Land -- RT in the Philippines, famed for his Blog "Drive-Bys." Critique My Blog! -- Billy Mac, whose blog didn't go dark the first time just because I asked for a review. It was only a coincidence. Late Bloomer Boomer -- Patti in Connecticut. When I Grow Up -- RDL. The home of Joke Friday. It's A Boomer Life -- Which it is. And the younger people are already counting the minutes until we're gone. Because that's when the ED commercials will finally stop. Talking to Myself -- Judi from Dallas. Airhead 55 -- Ralph, Patti's husband. I'm A Blogaholic -- a new group effort hosted by Dr. A. Rather Than Working -- Dave, a lawyer from Atlanta. Some material herein may be inappropriate for younger or more sensitive bloggers... and we don't really want to tell the children that we're talking about them, do we? That case I didn't try at the end of April because my health would not permit it was supposed to come up for trial again this week. Instead, it settled on Friday afternoon. And now the case can provide a useful illustration of the intersection between law and economics that Judge Posner never taught. My client was a cab driver in his mid-40's, a Muslim, born in Pakistan -- but a naturalized American citizen. He was injured when the defendant's SUV came tearing out of an alley in the Loop, clipping the right rear quarter-panel of my client's cab, rotating the cab clockwise into a concrete barricade. It wasn't a life-threatening injury. My client was taken by City ambulance to a hospital near the Loop; his ER charges were approximately $1,150. My client had a pre-existing condition: His left knee was arthritic before the accident. This condition did not cause him any problems before the accident; it had not even been diagnosed. But my client had pain following the accident. Increasing pain. Pain to the point where sitting, with his knee bent as one would while driving a cab, became increasingly difficult. He sought help from a chiropractor. The knee pain did not respond to the chiropractor's ministrations -- which the chiropractor billed at a cost of about $2,300. So my client was referred for an MRI to find out why the knee wasn't getting better. The MRI cost another $1,000. And the pre-existing degenerative arthritic condition was discovered at this time -- as were tears of the medial meniscus and the left anterior cruciate ligament. My client was sent to a surgeon. The surgeon tried a steroid injection; it didn't relieve my client's pain. The surgeon next evaluated whether surgery might help: It didn't make sense, the surgeon said, to repair the ACL tear; my client was not an athlete and he already had degenerative joint disease. However, the surgeon believed that a left knee arthroscopy for the meniscus tear would provide my client with a measure of relief. The bill for the surgeon's services came out to about $1,600. This did not include the cost of surgery, which my client can not afford. According to my client's surgeon, the total cost of that procedure would be somewhere between $20,000 to $30,000 -- surgeon's fee, anesthesiologist, operating room, follow-up therapy, etc. If you've been following along, adding on your fingers, you see that the total "medical specials" -- bills actually incurred as opposed to those, like the knee surgery, which might happen -- were about $6,000. Lost time would be hard to prove with a self-employed cab driver. From the defense perspective, there was another important fact: Our cab driver did not immediately seek out additional medical (or chiropractic) treatment following his visit to the ER. He 'gutted it out' for a period of a few months, as his pain increased. The argument would be that the accident may have been a momentary aggravation, but the real cause of the plaintiff's pain was his deteriorating arthritis... a condition he had before the accident. And then the defendant's insurer went one better. The insurance company found its own surgeon who, after reviewing the records, decided that both tears were caused by the arthritic condition, not by any trauma from an auto accident, and, moreover, the proposed surgery was inappropriate and would not alleviate the cab driver's pain. In fact, the defense expert opined, the proposed surgery would be "ludicrous." These opinions were reached without examining my client. Or reviewing an accident report. Indeed the defense surgeon was insistent that actually examining the patient about whom he was rendering these strong opinions was entirely unnecessary. One final fact: The defendant had a $50,000 liability policy. Some of the problems with this case you've already figured out for yourself: Juries may not like foreigners, even foreign-born naturalized citizens. You can ask about a prospective juror's prejudices in voir dire, but you can't guarantee that the prospective juror will be willing to share them with a room full of people... or even admit them to him or herself. But how would it color a juror's evaluation of damages? And our man would require an interpreter -- he can speak English well enough to take you where you need to go in his cab, but he would flounder if forced to try and cope with the specialized jargon of the courtroom on his own. I don't think that's an unforgivable sin -- but a juror might. And, to top it off, our man's doctors all happen to be foreign-born, too. But these are mere quibbles in comparison to the economic realities. You've heard of contingent fees. That means the lawyer gets paid if the client gets a recovery. That doesn't always happen. In Chicago, the standard contingency fee is one-third of the total recovery. So, to look at our case, if the defense coughed up the entire policy, there would be $33,333.33 for the cab driver... and the chiropractor (whose bill was not yet paid)... any other unpaid bills... plus the costs of the suit. The cost of filing the suit and getting the defendant served is a few hundred dollars -- that's not money for the lawyer, you understand, it's money for the Clerk of the Circuit Court and the Sheriff or maybe the private process server who has to be engaged. But that's just the beginning of the costs: When depositions are taken, the court reporter must be paid. The party at whose instance the deposition is taken pays for the court reporter's attendance and for the original transcript -- but the other party must pay for a copy, too, and the court reporter charges by the page. There's also a cost for obtaining the medical records. But the really big cost is the cost of getting the doctors' testimony. If our cab driver had broken his leg in the accident, as opposed to tearing one or two ligaments, perhaps the medical testimony would not be so important. A plaintiff has the burden to prove that his or her injuries were proximately caused by the defendant's negligence. In our case we needed the doctors' testimony to show what the injury was -- the tears -- and that these injuries were traumatically caused. Each side has to pay for its own doctors. My co-counsel was frugal; the doctors' discovery testimony cost about $2,000 -- just twice more than all the other costs put together. But, still, the amount our cab driver can recover is reduced by a further $3,000. And the surgeon would expect to be paid for his testimony at trial, too: In Illinois, we can either bring in the doctor live or take an "evidence deposition" -- which can be read in court in lieu of the doctor's actual appearance. The surgeon wanted $1,000 an hour for his evidence deposition. He wanted $1,500 an hour to come to court. And either way he expected payment in advance. The surgeon wanted $3,700 up front -- just as a down payment -- to agree to come to court. These amounts, whether for an evidence deposition or live testimony, would also have to come out of the client's recovery. And remember: the client's maximum recovery, if the defendant's insurer offered its entire policy, was $33,333.33. You've already realized that the defense was not going to cough up its entire policy: In fact, since the suit was filed, until Friday afternoon, the defendant's insurer had offered exactly what the little boy shot at -- nothing. And if their doctor didn't win the day for them, the defense still hoped to hold our recovery down to the ER bill and a little something for the cab driver's trouble in the few days thereafter. Believe it: Juries know about King Solomon and cutting the baby in half. If jurors in their collective wisdom see merit in both sides of a story, they will try and come in somewhere in between the extremes suggested by the warring parties. We would almost certainly have received a verdict in our favor in this case... but would it be for $5,000? (That would probably be somewhere around the amount that the defense would suggest to the jury.) For $10,000? $20,000? The defense would argue that the cost of future surgery was a ruse to give plaintiff a windfall: After all, he'd gone without this surgery now for some years. Why wouldn't he go on indefinitely... and just put any money the jury gave him for this procedure into his own pocket? A verdict for $50,000 was not impossible... merely unlikely, given all the facts. The only thing I know for certain is that, once we paid our surgeon, we'd have to recover $6,000 more at trial -- at least -- to put the same amount of money in my client's pocket. And if I and my co-counsel won a verdict, the defense could take an appeal... potentially tying up the payout for another year or two. So we settled. And I think we did the right thing. But the single biggest deciding factor was the surgeon's fee... for testimony. And, that, I submit, is a problem. Let's see how much hoopla is made about the sensible result as opposed to the gaudy allegations: Lubna Takruri of the Associated Press reports this morning about the outcome of D.C. Administrative Law Judge Roy L. Pearson's suit against a dry cleaning shop that, he said, lost his pants. Here's the bottom line, quoting District of Columbia Superior Court Judge Judith Bartnoff's order: "Plaintiff Roy L. Pearson, Jr. takes nothing from the defendants, and defendants Soo Chung, Jin Nam Chung and Ki Y. Chung are awarded the costs of this action against the plaintiff Roy L. Pearson, Jr."
Pearson had sued for $67 million. He later "lowered" his demand to $54 million. He reportedly turned down a settlement offer of $12,000. That's $12,000 -- for a pair of pants. The suit was widely cited by so-called tort reformers and other lobbyists as an example of how crazy the American justice system is. Do not hold your breath waiting for any retractions. There is one question that I have about this case, however: How did it get all the way to trial? Why could this case not be disposed of by motion? There may be grist for the reformer's mill in the answer to that question... but don't hold your breath waiting for any answers to this question either. In the post below you'll find the American Film Institute's list of the top 100 movies of all time. 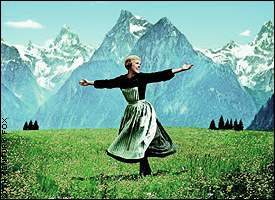 The Sound of Music makes the list at No. 40. This was my late mother's favorite movie. I haven't seen it in 30 years or more -- and I still know the words to all the songs. I remember, as a kid, going to the Coral Theater on 95th Street in Oak Lawn to see The Sound of Music. My mother took me several times. I want to say dozens of times... but I'm sure that's an exaggeration. I became thoroughly sick and tired of that movie -- to the point where, as the von Trapps are fleeing the music festival with the Nazis in hot pursuit, well, I wasn't exactly rooting for the Germans... but I sure was hoping that they'd catch the family -- just this once. My mother said we had to go see this movie; "otherwise," she said, "they'll never make another decent family picture." "Mom," I said, "why should they bother? We're still seeing this one." And then she clobbered me. Maybe I had it coming. And maybe they didn't make another decent family movie -- until Pixar came along with Toy Story. And every movie they've made since. Slowly but surely one of my favorite writers is coming back. Today Roger Ebert reports on AFI's list of the top 100 movies of all time. The list follows, lifted from Roger Ebert's website -- and the many links will take you to Ebert reviews. Of course, these are all movies Ebert likes; he's at his best (I think) when he truly hates, loathes and despises a movie... but that's a story for another time. ...I have to pass along the sad story of Alan Turcott of the Chicago suburb of Blue Island. The Chicago Sun-Times reports today that Mr. Turcott has a very serious squirrel problem: Squirrels have set his home on fire. Twice -- in an eight day span. Angela Caputo's story reports Turcott's house "caught fire when squirrels knocked high-voltage wires loose from a utility pole and onto his three-story house, fire officials said." 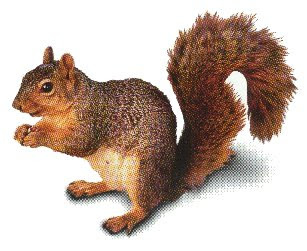 The Blue Island fire chief has confirmed that two "scorched squirrels" have been found, proving that, in the last moment of each squirrel's life, "they transferred power from one line to the next as they bounced across" two neighboring wires. Squirrels have eaten through my cable line before -- but they've never caused a fire at my house. I suppose Mr. Turcott would think my recent complaints about a squirrel in my house somewhat excessive. Well, he has a point -- but I'm still giving that window sill in my living room a wary eye every time I walk by. So there. 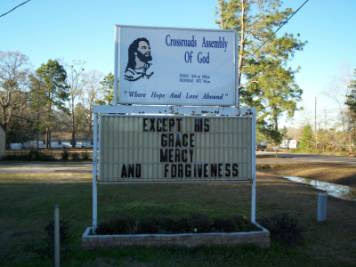 Joel Bezaire, the individual who posted this on his church signs Hall of Shame site, assumed that the person who put up this sign did not know the difference between "accept" and "except." But I'm thinking that a couple of kids out on a spree would be able to change "expect" to "except" in just a couple of minutes. Either way, it's kind of funny. Maybe some of those uber-dumb warning labels we see sometimes aren't really a reaction to overzealous lawyering. The management of Second Effort is not responsible for any damage that may be caused to your computer equipment should you choose to disregard this notice. The image was suggested by my blog friend Shelly's vacation story: She reported that she'd been to an ostrich race. So I asked her if she'd gotten a picture -- but she hadn't. Well, in light of my experience, that I shall shortly relate, I thought maybe she was telling me a tall tale. So I went out into the Internet and found this image... but I still can't be sure it's not Photoshopped or something. My client had a buddy who owned a piece of land well outside Chicago on which deer roamed freely. If they were playing with antelopes as well it would have come as news to my client. A lot of things might have come as news to my client. For example, he didn't know it was improper to hunt deer over a salt lick. Deer crave salt. And if you put a block of salt out in a clearing, deer will drop whatever else they were doing and run right over to partake. My client's friend knew this much. What he apparently did not know was that it is not sporting, and also illegal, to set up a hunters' blind above the salt lick so that he and my client could shoot the salt-licking deer like fish in a barrel. Keep in mind that these two were not using guns to shoot the deer; they were using bows and arrows. Whatever the body count on either occasion, there were a total of three dead ostriches. And these birds, the ostrich farmer said, were worth many thousands of dollars each. The new judge in our Law case felt that his colleague's determination of the facts in the Chancery case controlled the outcome in the case before him. He believed himself bound by the finding of no causal connection between the ostrich deaths and hunting activities next door. He therefore dismissed the case. An appeal followed... and it was successful: The dismissal was reversed on the grounds that the second judge placed inappropriate reliance on the findings of the first. But it all worked out in the end: We filed another motion to dismiss arguing an insufficient allegation of proximate cause in the new pleadings, even without taking into account any previous finding. The trial judge, who may have believed that the higher court had laid an egg in sending the case back to him, said he would not stick his head in the sand now: He again dismissed the case and everyone, except for the ostrich farmer, lived happily ever after. Even the deer. Because they could lick salt without getting shot at from a hunters' blind. 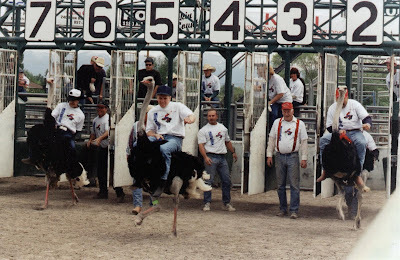 But, anyway, knowing what I learned in that case about the terrible skittishness of ostriches, don't I have reason to be skeptical of Shelby's claim that she saw a real live ostrich race? Don't I? Marvin the squirrel guy came back Thursday as promised (while I was safely at work) to determine if our recent squirrelly visitor was or was not a member of an extended family at home in our home. The attic turned out to be squirrel-free. And Marvin detected little squirrel footprints or something in or near the furnace, confirming, to the satisfaction of all, that our visitor had fallen down the chimney. When the house was tuckpointed a couple of years back, we had the contractor put up a screen of sorts. But it didn't take. So Marvin returned again on Sunday morning to install a new barrier. He even removed a few nearby branches from an overhanging tree. It was probably from one of those branches that our clumsy visitor slipped, falling into the chimney in the first place. Meanwhile, Older Daughter came up from Indianapolis for the weekend, it being Father's Day and all. She parked her car across the street and made it almost to the front walk before she was waylaid by the neighbor kids... the same neighbor kids who, even as Marvin was capturing the squirrel, were lobbying Long Suffering Spouse and Younger Daughter to keep the beastie as a pet. Older Daughter has babysat for these kids in the past. "Did you know there was a squirrel in your mom's house?" said one. "And a man came and put it in a cage!" said another. "It was in your mom's house!" said the littlest one, who could think of nothing original to say at that precise moment. "And they wouldn't keep it as a pet!" Three kids, four comments, and maybe two footsteps by Older Daughter... who thanked the kids profusely for the information and eventually resumed her journey toward the front door. It gave Older Daughter an immediate topic for conversation. She burst into the house. Did she greet her mother? Did she greet me? Did she say, "Hello, I'm home?" No, she marched into the den and demanded to know: "Did you have a squirrel in the house?" This is a link to a timeline purporting to show the history of the Internet. It begins, as it must, with a picture of Al Gore, and the notation, "ARPANET (precursor to internet) invented. (If anyone makes any overused Al Gore jokes they will be beaten unconscious with a 300 baud modem)." Al Gore was in Chicago recently, at the Borders bookstore at Randolph and State, signing copies of his new collection of sermons. Eager book-buyers lined up early awaiting St. Albert's arrival, many of them loudly encouraging him to declare himself a candidate for the 2008 Democratic presidential nomination. I didn't know there were that many Republicans left in Chicago. Yeah, I know, don't give up your day job, kid. What was that sanctimonious claptrap that Curmudgeon was spouting this morning? Eventually, he rose to investigate. It was a squirrel. Sitting in the front window. That same squirrel is now roaming around the Curmudgeon's bedroom. Long Suffering Spouse has come back from teaching summer school and will not enter the marital abode until said squirrel has been dispatched. The City of Chicago promises service... maybe sometime today. Curmudgeon found a pest control service on line... eventually... maybe he'll tell you about it later. But there's a squirrel in the house! I have to be careful venturing into the realm of gardening advice: Regular visitors (and dedicated gardeners) like Fran of Where Fibers Meet Mud would know in a second that I'm no gardener. Weekend gardeners, occasional gardeners -- even window box gardeners would see through me. Because, in my house, it's Long Suffering Spouse who handles the garden chores. She likes it. I could live in a highrise and get all the nature I need at the ballpark. But, nevertheless, today I have a gardening tip for you. Have I sufficiently lowered your expectations? See, with all this staying inside, I read. As I recently read the latest issue of Discover Magazine. The current issue features a fascinating cover story on the relationship between science and Islam. A common soil bacterium, Mycobacterium vaccae "may be able to alleviate depression." It turns out that gardening really can make you feel good. When injected into mice, the bacteria, M. vaccae, activates "a set of serotonin-releasing neurons in the brain - the same nerves targeted by Prozac." In another study, lung cancer patients injected with killed M. vaccae "reported better quality of life and less nausea and pain." Discover reports that the study, with the riveting title, "Identification of an Immune-Responsive Mesolimbocortical Serotonergic System: Potential Role in Regulation of Emotional Behavior," by Christopher Lowry et al. was published online on March 28 in Neuroscience. But the bottom line is "that simply inhaling M. vaccae -- you get a dose just by taking a walk in the wild or rooting around in the garden -- could help elicit a jolly state of mind." I'd provide a link to the Neuroscience article, but I couldn't find it this morning. There are, however, any number of articles about that article. And it's a subject even I've written about before. A year ago I reported on another study that suggests that clean living has its downside -- or why you shouldn't panic when your toddler eats a little dirt: It's good for developing the immune system. However sophisticated we are, however much we disguise our origins, we are still creatures of the earth. We forget this at our peril. I try and read two newspapers a day and I almost always read one. I read the news on line and watch TV. Still, it was the Beach Bum that put me on to this story about an administrative law judge in the District of Columbia who is suing a dry cleaners for the loss of his pants. His initial claim was for $67 million, $65 million under the DC consumer protection act and another $2 million in "common law claims." According to Emil Steiner's OFF/beat column in the Washington Post, the Korean family that owns the dry cleaners offered $12,000 to settle the suit. That's $12,000 for a pair of pants. And, since the story went public, the judge-with-the-$67 million-pants, Roy L. Pearson, has lowered his demand... to $54 million. Lubna Takruri's AP story about the case can be found at examiner.com. I provide these links because I don't want you to think I'm relaying some sort of Internet hoax. The AP story says that Judge Pearson's claim against Custom Cleaners now focuses on a couple of signs inside the store. "The suit alleges that the three defendants, Jin Nam Chung, Soo Chung and their son, Ki Chung, committed fraud and misled consumers with signs that claimed 'Satisfaction Guaranteed' and 'Same Day Service.'" The AP says that Chris Manning, the Chungs' attorney, argues that the signs "could only be considered fraud if the signs were misleading to a 'reasonable' person, and no reasonable person would interpret the signs to be an unconditional promise of satisfaction." Pearson, not surprisingly, is proceeding in this case pro se. That means he is representing himself. "Because Pearson is representing himself," the AP story reports, "the litigation has cost him nothing." Of course, as Abraham Lincoln once said, "A man who represents himself has a fool for a client." On the other hand, Mr. Manning, the Chungs' lawyer, points out that what Pearson has done, "it appears as a trial strategy, is to keep up his aggressive stance so he keeps costing the Chungs money." The good news? The trial starts today. Hopefully, it will be finished today as well -- but one can never tell. This is not Judge Pearson's first brush with aggressive litigation. Here are two different links to a 2005 appeal in his divorce case. This is the Findlaw link; this is the official Virgina link. If you prefer Westlaw and have a subscription, you can find this unpublished appellate opinion at 2005 WL 524597. Pearson was unemployed at the time of his divorce and he sought maintenance from his ex-wife, also an attorney. The trial court refused -- and, in addition, ordered Pearson to pay $12,000 in legal fees to his wife. The Virginia appellate court affirmed, noting (slip op. at p. 10), "The trial court found that husband was substantially responsible for 'excessive driving up' of the legal costs by 'threatening both wife and her lawyer with disbarment [sic],' and creating unnecessary litigation.... Credible evidence supports the trial court’s ruling. The trial court made specific findings concerning the award of attorney’s fees, including that the litigation was disproportionately long despite the relative simplicity of the case and that husband 'in good part is responsible for excessive driving up of everything that went on here including threatening both the wife and her lawyer with disbarment as a member of both the D.C. bar and Virginia bar,' which created 'unnecessary litigation.'" And one other thing: According to this May 3, 2007 editorial in the Washington Post, Judge Pearson is up for reappointment to the bench. Clearly the newspaper is against reappointment -- but I think the good people of the District of Columbia need to think this all the way through: If Judge Pearson has no job, what else will he do all day but file more frivolous lawsuits? INSTANT UPDATE: Before posting this, I found a blog which claims that Judge Pearson was not reappointed. I can not verify this, however, at any 'mainstream' site. Perhaps someone in the D.C. area can advise? No, that isn't me over on the left, but I too was sweating bullets a little earlier this afternoon. I'd been working on a response to a potentially dispositive motion all week -- reading cases, finalizing affidavits... that sort of thing. I found that, in addition to these traditional responses, I also needed to file three motions of my own... one attacking the other side's affidavit, another seeking leave to clean up my pleadings and still another one seeking to stay (legalese for put the kibosh on) proceedings instituted by the other side in another forum. The particulars are not important to this story. I got home around 10:00pm last night, mostly pleased with myself, and on a couple of different levels, too. I'd come home late three nights out of four this week, and only on Wednesday did I not think I was particularly productive -- and even then I spent most of the day researching. Reading cases. Cogitating. (Thinking mostly about how I wish I could expect payment of my hourly fee on this matter... but that's also another story.) The point is I was able to exert myself in ways I have not been able to since my surgery. That was good. Also good was the feeling that I'd done good work -- that my client was well-served by my efforts and that I'd left nothing that needed saying unsaid. Of course, the attorney who referred the case to me read my stuff overnight on Thursday and found that I'd left a couple of things unsaid after all... but his suggestions were constructive and I was happy to incorporate them this morning. But then I had to face the real challenge. I had to e-file my papers. The District Court here wants everything filed electronically these days -- although we have to take paper copies over to the Federal Courthouse for the judges themselves. It's actually kind of nifty: The document, once filed, pops up in the email of all the other attorneys... no postage... no envelopes... less photocopying. The bad part is everyone else's documents come to me the same way. My poor little inkjet printer must do yeoman work some days. Anyway, they have a training course for the lawyers to take to navigate the e-filing system here. When you graduate you get your super-secret password and decoder ring and you are authorized to file. I didn't get the training. I got my password in a fit of pique. This system was imposed on us a couple years back now. I don't do a lot of work in the Federal court and, frankly, I wasn't interested in learning anything new that I wouldn't use on a regular basis. But I had one matter pending as the transition to e-filing was underway and I had occasion to be in the Clerk's office one afternoon because of it. And, because I have a big mouth and limited self-control, I began carping about this new system. "I'm too old for this," I grumbled, using one of my recurring themes. "Well then, sir," said the prissy little man who was apparently the deputy assistant underclerk in charge of e-filing, "perhaps you're too old to be practicing law." "Harrumph," said the prissy little man, and he harrumphed again when I quickly filled in the form and handed it back. "You'll get your access code in the e-mail tomorrow," he said. You do know how to open up an email don't you? He didn't actually say this... but the look on his face made it clear that this was in his mind. And in our little snit there the requirement of my participation in the training course was somehow waived. Since then I have e-filed maybe two documents, a page or so each. And gotten hate email from the Clerk thereafter about what I did wrong. On the couple of matters which I have handled in Federal Court since the imposition of this e-filing regime, I have had co-counsel who could undertake the e-filing for me. But I don't have co-counsel in Chicago on this case -- I'm the only one who can file documents here. Which brings us to today. When I had to file these eight documents. But I did. They all went through. And I'm pretty sure I filed the documents I intended to file, too, extracting all the draft pages in Adobe and inserting the corrected pages as necessary. So it was my techno-legal triumph of the day. This was the best I could do, but I only played at the site for a little while. You can design and generate your own official seal using the Official Seal Generator. Herewith a map of the Blogosphere that I found "stumbling" around the Internet the other evening. It's not how I would have imagined it -- but I'm guessing the artist may have had a map of Middle Earth by J.R.R. Tolkien in mind? You can get a larger version of the map by clicking on it. I found the map here. In the meantime, I'm working on a big project -- actual legal work, believe it or not -- so I may not get back here until late today... or even tomorrow. Odd that we make this prayer on the anniversary of D-Day -- or maybe not so odd. We should never forget that something as valuable as peace can sometimes only be achieved at great cost. Because our prayer is for peace: Real peace. Freedom. Security. Safety. For one and all. No, I haven't gone "pay per post." But I saw that the BlogHer Conference is to be held in Chicago next month and I wanted to pass the news along. The BlogHer home page says that there are over 9,000 blogs that are listed in its blog index, providing numeric support for its claim that BlogHer is "where the women bloggers are." BlogHer is open to anyone and everyone who considers themselves part of the blogosphere, and is particularly focused on serving women who blog. All ages, etnicities, genders, and levels of blogging experience are encouraged to attend. So why am I plugging the event? I call it "enlightened self-interest": The taxes on your hotel, your meals, any event tickets you might purchase -- all of that will help defray my property taxes. So I strongly encourage tourism: Whenever I see anyone consulting a map in the street I immediately offer assistance. I want this person to go home to Düsseldorf (or wherever) and sing the praises of the nice people of Chicago... so that, next year, his neighbors will come, too -- and bring more money. 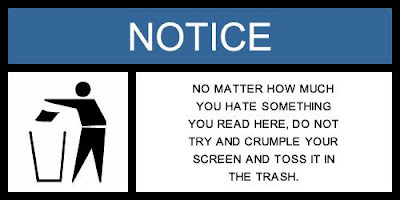 I'm not a Curmudgeon for nothing, you know. Besides that, as some of you may have noticed over time, I consider myself a civic booster and unofficial cheerleader for what I truly believe to be a beautiful city. So make plans to come to BlogHer -- and don't tell 'em that the Curmudgeon sent you. Oldest Son moved out this weekend -- he's taken an apartment in Lincoln Park and he's started his new job and, we hope, all will be well for him. But that leaves two teens and a post-teen at home for the Summer. And I'm increasingly sleep deprived. The kids want to stay up late. They want to stay out late. Sometimes, they want to go out late, as Oldest Son did Friday night. He had to wake me up to tell me he was leaving. I truly believe that kids are wired differently. Kids naturally want to doze the day away and stay up all night. My observations in this regard are supported by research which suggest that early school start times may be wonderful for teachers but not at all conducive to learning. No, I'm not providing a link; this is one of those things I read some time ago and I could probably find it, or something similar, if I spent the morning looking for it... but I have too much work to do this morning to indulge in the luxury of clicking around the Internet in search of an article I surely read the old-fashioned way, on paper, in a magazine. Yesterday was fairly typical. After Mass, Youngest Son took off for the park with his friends. Younger Daughter went to work. Middle Son slept until Oldest Son shanghaied him into helping with the move. Youngest Son is essentially through with 8th grade; this is basically a party week -- a ceremony today, a trip to an amusement park tomorrow, a dinner dance on Wednesday. So it was not surprising that he'd want to stay up late. It was even less surprising given that he returned from the park in the mid-afternoon, stretched out on the couch, and napped for three hours. And Younger Daughter has finals this week, so she got permission to leave work early and come home in the middle of the afternoon... whereupon she promptly fell asleep. Remember: These are the same people who, as toddlers, would not take naps no matter how hard we tried to get them down, feeling guilty all the while because we had failed to follow the best advice of expert pediatricians (paging Dr. Spock, paging Dr. Brazelton). Fast forward to last night, around 10:00 pm. I was trying to store up enough energy to get out of the recliner and head up the stairs to bed. Long Suffering Spouse had already surrendered herself into the arms of Morpheus (somehow she'd gotten hold of the couch in an unguarded moment). Youngest Son tried to sneak a movie into the DVD player -- I parried that thrust -- but then Younger Daughter came down from "studying" and said she "needed a break" -- and signed on dial-up. She couldn't use the cable modem because Middle Son was conducting a spirited discourse with multiple AIM correspondents. What happened next is spotty because I was drifting in and out of consciousness at this point, but somehow over the next half hour or so I shooed the younger two upstairs. "Why?" asked Youngest Son. "I won't be able to sleep; I'll just be staring at the ceiling." I was not sympathetic. And when Long Suffering Spouse and I eventually straggled up the stairs an hour or so later, lights were still on and teenagers were still moving about. And when I complained that I would like the house to be quiet before I retire for the evening, I was informed in no uncertain terms that I was being entirely unreasonable. From Zyra -- the site includes all your "favorite" Bill Gates operating systems... and the various alternatives as well. Yes, Bee, one more quick baseball post. But don't blame me: Bennie put me up to it! 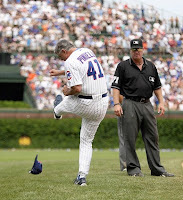 In a March 24 post looking forward to Opening Day, I predicted that the new Cubs manager, Lou Piniella, would melt down by Memorial Day. Piniella melted down yesterday. So I was off by five days. Apparently the length of Piniella's suspension won't be determined after the Commissioner's office has an opportunity to hear Sweet Lou's side of the story. 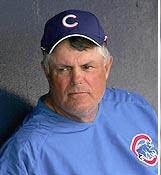 If Piniella's smart, he won't answer his phone. At least that's what Sox announcer Ken "Hawk" Harrelson just said. Looking quickly on Yahoo! just now it appears that North American Sports Net may have been acquired by ESPN, the American sports cable giant. Today's White Sox - Toronto game is on Comcast Sports Net in Chicago so I don't understand how ESPN can farm the game out to a European subsidiary... but I'm merely reporting what I heard. Anybody across the pond able to catch the game today? Those of you with kids nearing adulthood may remember the Where's Waldo craze of a few years back -- I guess it was "Where's Wally?" in the U.K. In some households, I'm sure, it was all an act: Dad would let the kids find Waldo first so they could feel successful. The kids always could find Waldo... and I couldn't. You may not remember, however, that this game was played before the Waldo craze, in movie theaters around the world, every time an Alfred Hitchcock picture was shown: Hitchcock allegedly had a cameo appearance in each and every picture he made. Here's a site that will show you 37 such cameos (out of a total, apparently, of 41). Nobody, it seems, can find the remaining four.